After spending years sitting in waiting, President George H.W. Bush’s custom-painted train Bush 4141 will take him on a final ride. 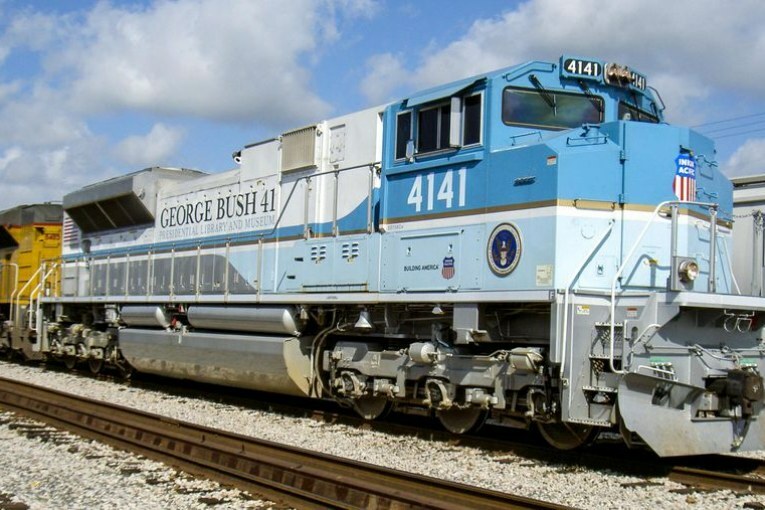 Unlike other engines on the rails, Bush 4141 is the only one to have ever been driven by its namesake and a former U.S. President. Michael Iden, who worked closely with the crew to create Bush 4141, was aboard the historic ride. Iden says Bush requested to take a tour of the locomotive a day just after it was dedicated to him. “The president looked at us and said with a smile on his face, ‘Do you mind if I take it on a drive? '” Iden said. After a brief lesson, Bush took control of the train and went on his first ride. Since then, Bush 4141 has been in storage. Now, the locomotive has been called to duty to transport President Bush from Houston to his final resting place at the George H.W. Bush Presidential Library behind the Texas A&M campus next week. President George H.W. Bush will lie in state in Washington D.C. with a public visitation in Houston, before his final resting place in College Station, alongside wife Barbara and daughter Robin. Bush’s funeral will be held Dec. 6 at St. Martin’s Episcopal Church. The arrival ceremony will start at 4:30 p.m. on Dec. 5 at Ellington Field, then he will lie in repose at 6:45 p.m. at St. Martin’s Episcopal Church. The funeral service at the church will start at 10 a.m. on Thursday. The departure ceremony will start at 11:15 a.m., where he will then be transported by motorcade to Union Pacific Railroad Westfield Auto Facility. The train will run from the Spring Yard then make the turn near Old Town Spring heading west crossing, I-45, under Holzwarth, under SH 99 at Spring Klein Park, crossing Northcrest passing Hildebrant Intermediate School, then cross Kuykendahl, running along Kuykendahl Huffsmith. After going under FM 2978 it will enter Tomball passing near Mel’s Cafe it will then head towards Magnolia crossing Hardin Store on the set of tracks Decker Prairie Church hitting SH 249 and running along FM 1774 crossing FM 1488. It will continue through Todd Mission. It will meet the east-west tracks on SH 105 at the Chandler Railcar repair facility and then west through Stoneham passing High Point Elementary School. It will continue toward Navasota and start running parallel with Highway 6 behind the Trinity Industries Plant. Going through Navasota it will meet FM 2154 at Highway 6, through Millican and travel along FM 2154/Wellborn Road to the George Bush Museum. The trip is expected to last 2.5 hours. Only five other presidents have had funeral trains, with the last being President Eisenhower. 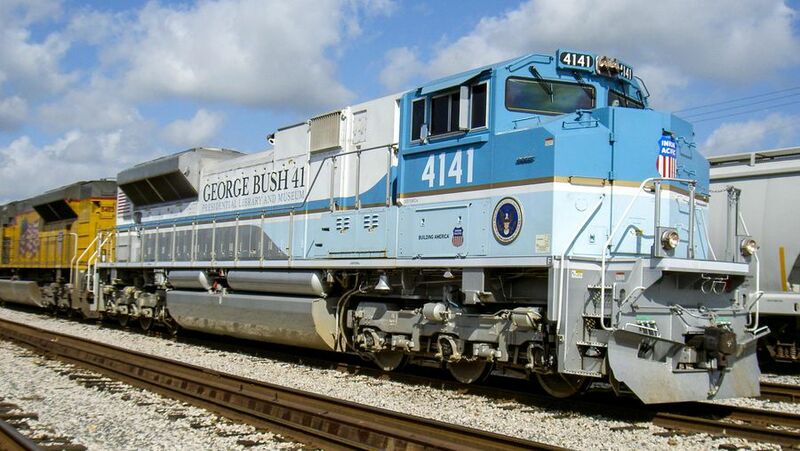 This was something President Bush wanted because he loved trains. Once the train arrives in College Station, it will be greeted by the Corps of Cadets. At the library, there will be a brief service with a flyover with the missing man formation. Following the service, the family will accompany the casket to the burial site, alongside his wife Barbara and daughter Robin. Bush will be honored in Houston on Monday at a public memorial service and will lie in state in the U.S. Capitol Rotunda later that evening until Wednesday morning. I am planning on being in Magnolia on Thursday! US Flag in my left hand, saluting with my right with my hand to the brim of my service ball cap as Union Pacific 4141 goes by!